This sink is great looking and great quality. It is easy to keep clean and has been a wonderful upgrade to my powder room which guests can see as they enter my home. Dimensions 18.75 In. X 14.25 In. X 5.25 In. I bought two of these sink/faucet sets for my master bathroom. They are very high end looking and remind me of sinks in a fancy European hotel. The faucet is very sleek and the chrome finish pops against the white ceramic. A great sink set for a fabulous price. I ordered these sink and faucet combos for a remodel project I was working on. The sinks are great quality and the faucets are as well. The installation in the granite countertop was easy and the sinks definitely make a statement. 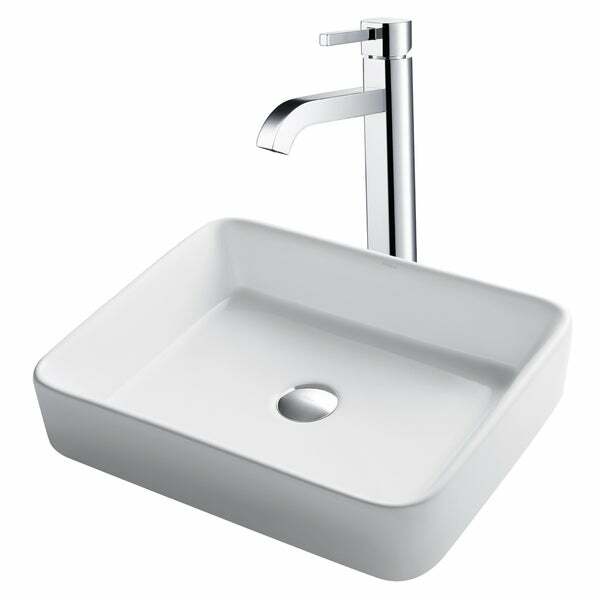 excellent quality products--both the sink and the faucet by Kraus have the look and feel of quality. It is easy to install and not as small as the measurements would imply. Size and weight gives the look we wanted. I bought these purchases about three months ago. It was on special and I thought this would be perfect for my office as I needed an update. Firstly, the sink is very nice. It’s got a soft look/ it’s not super structured and sharp edged.… So if you want something more modern and structured - this is not the one for you. This has soft edges. I don’t know any other way of explaining it. The faucet unfortunately does not seem to come clean. It gathers watermarks on top of the spigot and sides - no matter what I clean it with. Basically, It doesn’t clean well. It’s just streaks all over. It’s very hard to recommend even though the design looks great. It works well. It’s just the sink faucet is very hard to keep clean. I love, love the vessel sink and faucet. I upgraded my vanity for a fresh look and I really like the look. The quality of the faucet is an astounding plus. Ordered two of these for our master bathroom remodel. When they came in, I thought they were beautiful and was excited to use them. However, when it came time to install on our 72" countertop, they took over the space. Honestly, they looked like two baby bathtubs. Had to return. I also wanted straighter edges to match the shaker style cabinets and these were soft rounded. The overall quality was great. Just make sure you want extra large sinks on your counters! This sink/faucet set exceeded my expectations! I have not installed it yet, but it is so pretty! It works perfectly with the contemporary look I'm trying to achieve. I searched highly and low online and Overstock always seems to have the best selection at an amaxing price! Yay for me!! Great quailty! I loved how it came with the faucet and the plug. I ended up going with a different sink, but if you are looking for a great vessel sink, this one is an excellent option. I've had this sink for over 3 years now, and it's still going strong. Looks modern and sleek and goes perfectly in a contemporary bathroom. It is a nice looking unit. Matching faucet is also quite nice. Not difficult to clean it. When you install it make sure to use good enough plumbers putty. As it tends to leak if the putty is not applied correctly. Beautiful sink - love it! nother great purchase from Overstock.com! A quality product, and fast shipping, as always! Looking forward to my next purchase from overstock! "does this sink come with the drain?" Hello carla, this awesome item features a pop up drain that matches the faucet finish as well. Thank you for shopping with us. "Can I get a flow restrictor for this faucet to reduce flow to 1.5 gpm?" Hello pruler, you will be contacted by Customer Care. "I have an 18" deep countertop...can I fit this sink with the faucet behind? I am trying to figure out if the faucet will fit in 3" behind the sink." Hello Pat, you would need an additional three inches to fit the sink and faucet. Thank you for shopping with us! "Does this sink have an "overflow" hole/drain? Thanks, Enid"
nope - its fairly 'deep', but I noticed many vessel-type sinks don't have overflows, which may or may not be a problem.